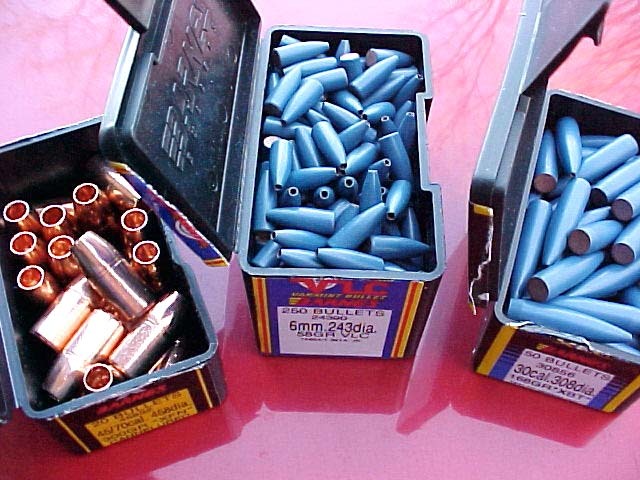 Almost every day I receive questions from readers wanting information on the subject of ammo reloading, such as bullet selection and powder recommendations. I am always glad to help, but I also suggest that everyone who loads their own ammunition should have at least a couple of good loading manuals. There are several on the market published by the major powder and bullet manufacturers. All are helpful to a certain extent. I like to compare data from at least two sources to help in choosing the correct powder and load for a certain bullet. I will usually decide first upon the bullet to be loaded, and then select the best two or three powders to load behind the bullet, experimenting with accuracy and velocity tests. Without the guidance of loading manuals, a great amount of time and components would be wasted, still resulting in perhaps a substandard load. I have been loading my own ammo, and lots of it, for almost thirty years, and would not be without at least a few good loading manuals. 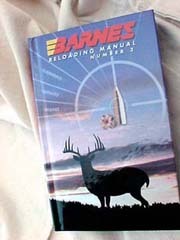 One of the latest and most comprehensive loading manuals available is put out by Barnes Bullet Company. 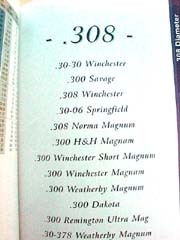 Like most manuals produced by bullet manufacturers, the data is specific to Barnes’ own line of bullets, but includes data using almost every available source of powder, including Accurate, Winchester, IMR, Western, Somchem, Hodgdon, Vihtavuori, Norma, and Alliant. This is the most extensive variety of powder used by any bullet company of which I am aware, and proves Barnes’ commitment to providing the best and latest data that is applicable to the use of their bullets. This would be a good place to interject that data for other bullets should not be used for Barnes bullets. 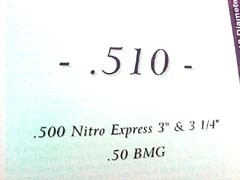 Barnes produces bullets that are very unique in design, and possess traits that, while making them superior to many bullets on the market, do require specific load data to take full advantage of their unique ballistic properties. 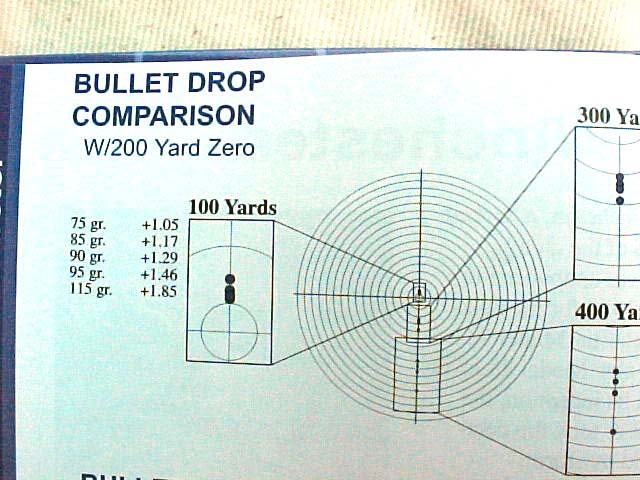 Even within the Barnes family of bullets, load data cannot be fully interchanged between the different designs of specific bullets. 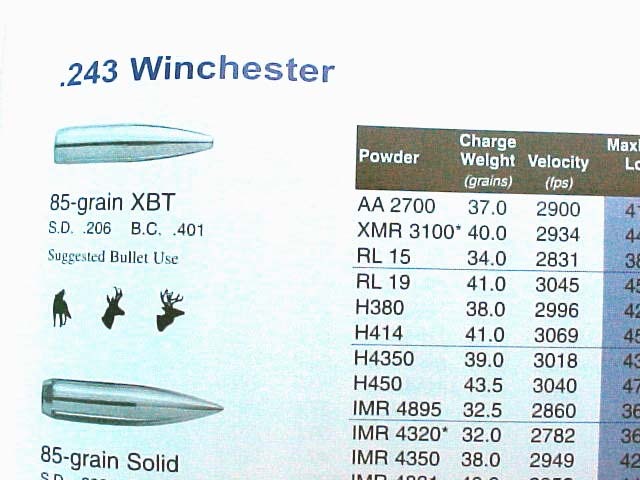 For example, data for the coated and non-coated bullets is not interchangeable, due to the excellent lubricating properties of Barnes’ proprietary, baked-on bullet coating. This bullet coating has made the Barnes XLC and VLC some of my favorite bullets. They are capable of achieving greater velocity than non-coated bullets, while exhibiting fine accuracy, excellent terminal performance, and greatly reduced fouling. This bullet coating is not to be confused with the messy moly-coated bullets sold by others. The VLC is my first choice in an accurate bullet for varmint hunting. 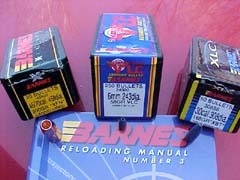 Barnes number three manual contains the most extensive list of cartridges of any loading manual that I have ever used. It contains data for many old cartridges that are ignored by others. Barnes makes bullets in nineteen different diameters, covering the needs of just about any rifle cartridge, and several handgun rounds as well. A few of the older cartridges included are: .250-3000 Savage, .300 H&H Magnum, 9.3x62mm, .450-400 x 3", .416 Rigby, and .470 Nitro Express, among many others. 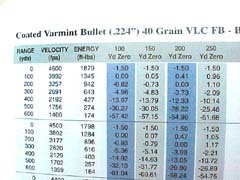 The load data also includes many wildcat cartridges including the .22-250 Improved, .338 Scovill, .358 Shooting Times Alaskan, and several others. Some of the newest cartridges on the market are also included such as the .260 Remington, 6.5-284 Norma, .300 WSM, .458 Lott, and .450 Marlin. 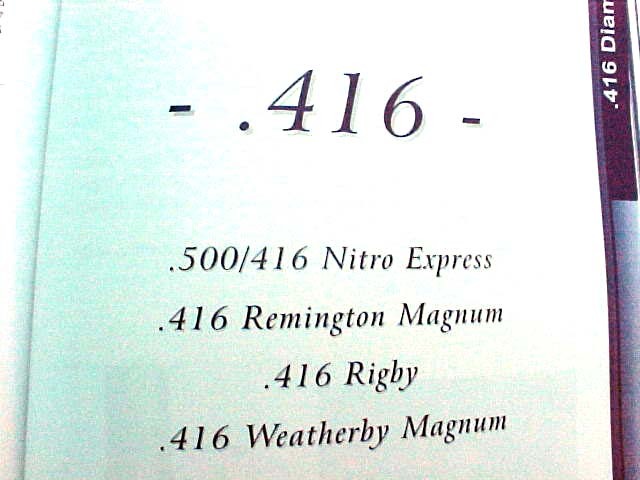 Data is included for the line of Remington Ultra Mag and Dakota cartridges as well. I have never seen a loading manual that is as full of such a variety of data as this one. There is loading data included for at least 89 cartridges (I might have missed a few), as well as data for muzzle loading rifles using Barnes bullets. 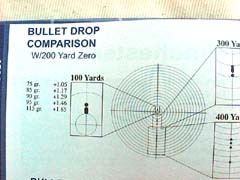 In addition to the very comprehensive and detailed loading data, the ballistics charts included in each caliber-specific section, provide very useful information regarding bullet drop, retained energy, wind deflection and time-of-flight out to 600 yards for cartridges ranging from the .22 Hornet up through the .50 BMG. Also included within the 786 page manual are instructions for loading ammo, cleaning the bore, and properly breaking-in a rifle barrel. 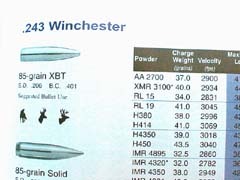 There is a section describing the complete line of Barnes bullets, another section with customer hunting photos, and one with a brief description of company history and facilities. All of the charts and graphics are clear and easy to understand. The Barnes #3 manual is very interesting reading even without the excellent data provided. 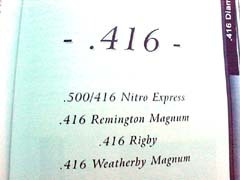 There is a short description and history given for each cartridge listed, written by hunters and shooters who use that particular cartridge. Barnes really put a lot of effort into this new manual, and I congratulate them on a job well done. 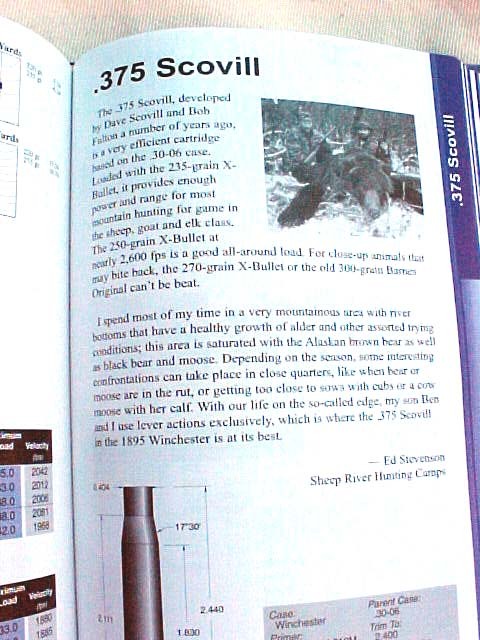 This book is essential for anyone using Barnes bullets, and if you are a serious rifle shooter or hunter, you should be using Barnes bullets. 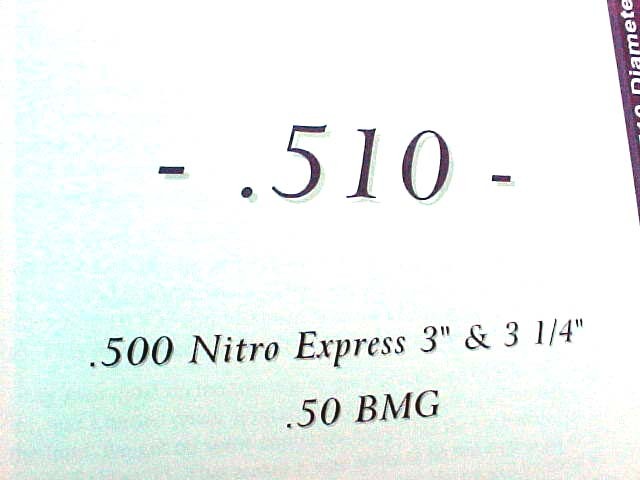 Barnes makes bullets suitable for taking any game on Earth, and for accurately shooting targets at long range. Whether you prefer the Barnes Original, Solid, X-Bullet, or VLC, this manual contains all the information you need to achieve the best possible performance from your gun and ammunition. You can find this new Barnes # 3 manual at any well-stocked shooting supply store, or order it directly from Barnes website for only $25.99 at: www.barnesbullets.com. It contains a wealth of information that would be virtually impossible for one shooter to gain own his own during a lifetime of shooting. I highly recommend it. 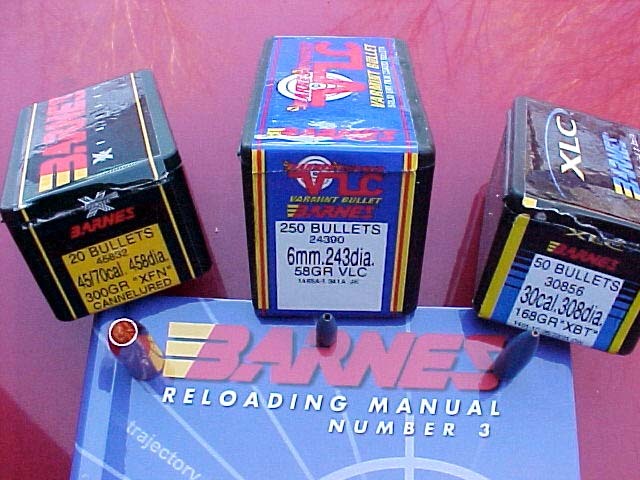 Barnes Bullets Reloading Manual #3 is a great source for loading data using the excellent Barnes bullets in a staggering variety of cartridges. 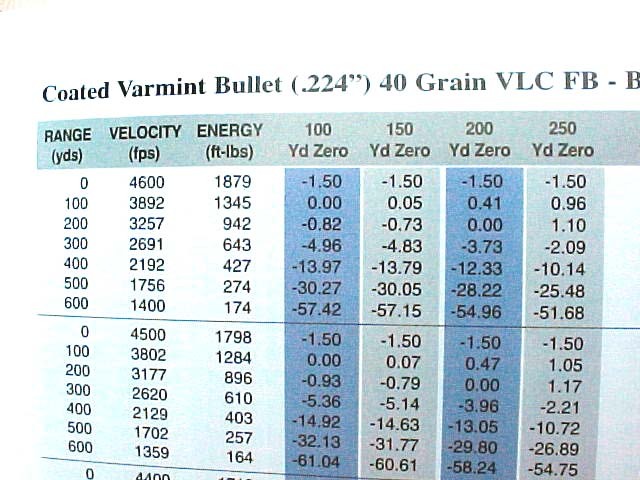 A wide variety of charts is included to aid the reloader in calculating ballistics for virtually any bullet weight in virtually any cartridge. 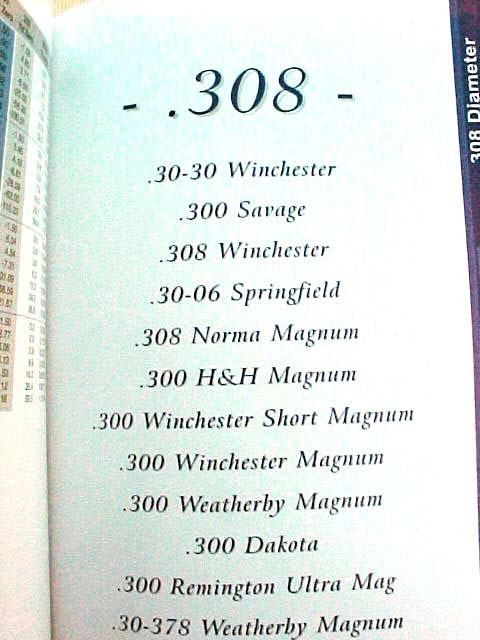 A small sampling of the data from Barnes' Reloading Manual #3 gives a glimpse of the wealth of information included. 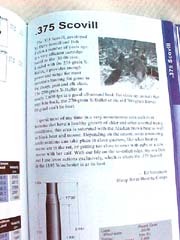 Author highly recommends both Barnes' bullets and Barnes' Reloading Manual #3.